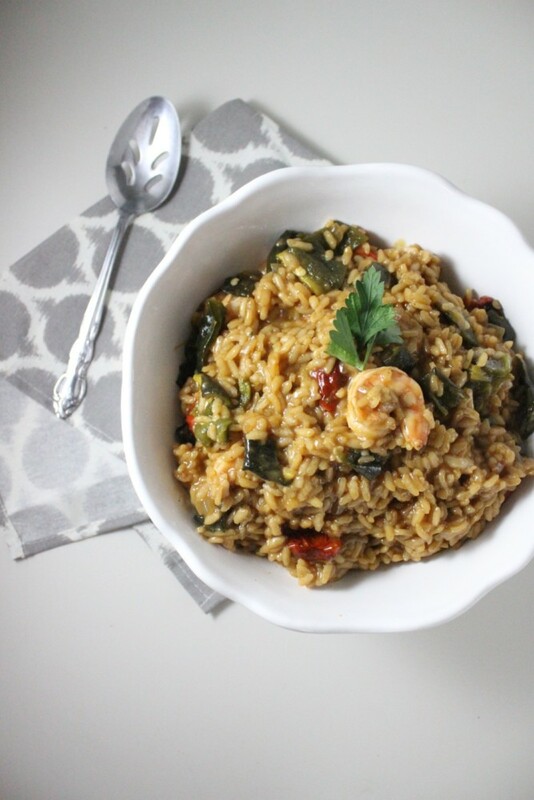 You guys, I’ve just kicked up risotto to a new level and I can’t wait to share it with you! 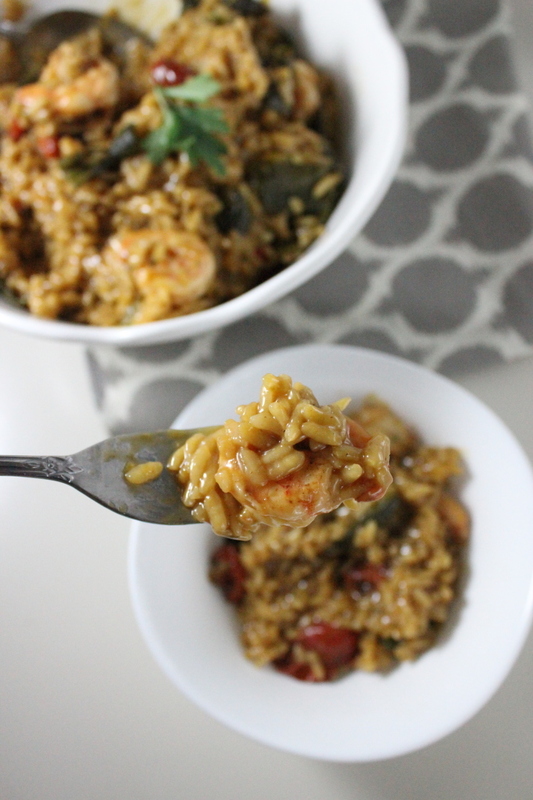 And trust me, I know this recipe has nothing to do with Thanksgiving but I thought that it’d be a great one to pin and make after the holiday since it has some shrimp in it. Also, I don’t know about you, but I can only take Thanksgiving leftovers for a couple days until I start to go nuts and crave something lighter and healthier! The operative words of this post title are definitely “roasted poblanos.” I picked up a bunch of them at the Agora Farm stand at Eastern Market and immediately knew I wanted to roast the crap out of them. 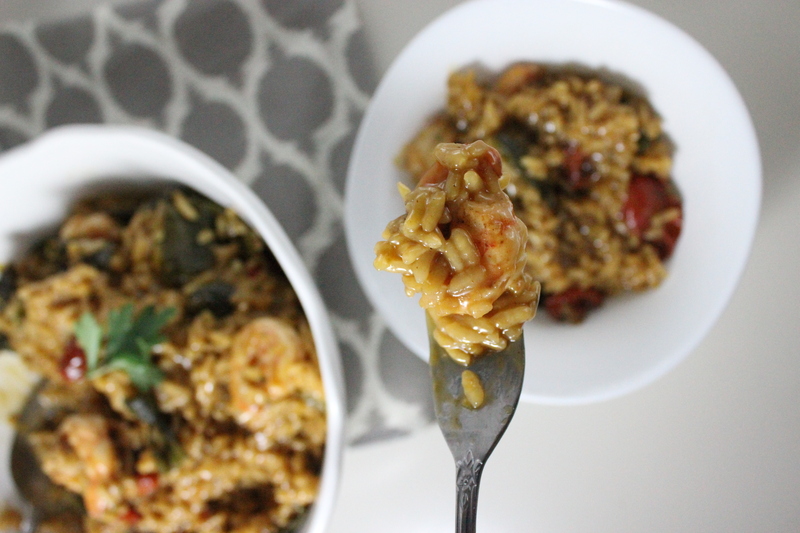 I love love love risotto and tend to cook it more when the temperature starts to drop, but I was growing tired of the same old same old preparation so the recipe was born completely out of me wanting to change things up. As a result of my poblano experimentation, this dish is very spicy so if you don’t like spice you can substitute a couple sweet red peppers instead. Frozen shrimp is great to have on hand because it is full of protein and also defrosts in a flash if you forget to take it out of the freezer before work. To thaw it quickly, place unpeeled shrimp in a large bowl full of ice water. Let it sit for 20 minutes and then drain, peel and devein the shrimp. I like to do this right when I walk in the door from work that way I can tend to some housekeeping things and prepare other parts of the meal while the shrimp is thawing out. 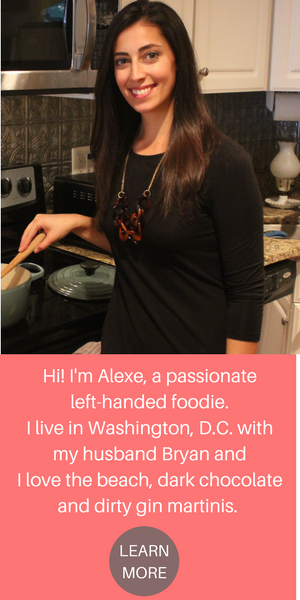 Efficiency in the kitchen is my jam, people. Place shrimp in a bowl and drizzle with lemon juice and salt, pepper, cayenne and parsley. Let it marinate while you do the following steps. Lay the whole poblano peppers and cherry tomatoes on a sheet pan and drizzle with evoo and season generously with salt and pepper. Roast for 20 minutes. 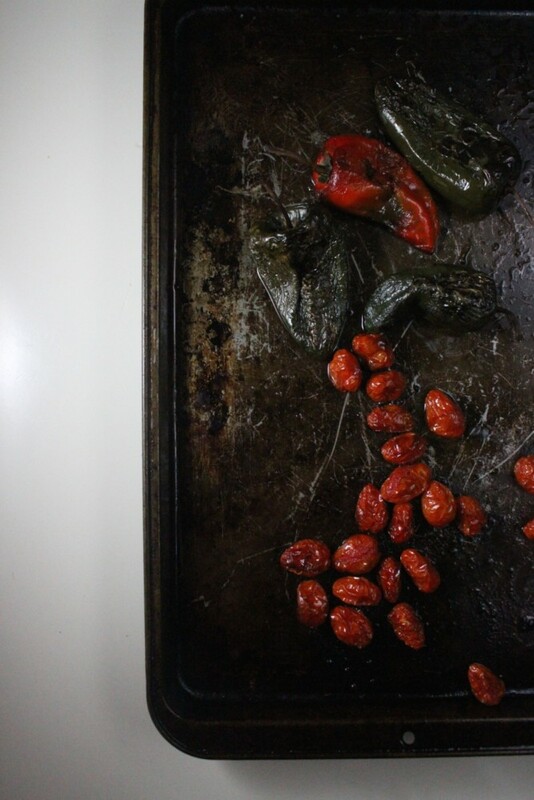 Remove from the oven and place just poblano peppers in a bowl with plastic wrap and let sit. The plastic wrap will make it easier to peel the skin from the peppers. Place tomatoes in a large bowl and set aside. On medium heat, place evoo in large pan and cook onions for 5 minutes. Add in the arborio rice, and toast up for about 2 minutes, constantly stirring. Season with a generous pinch of salt and pepper. Lower heat to medium low and slowly pour in vegetable broth and keep stirring. Once broth is absorbed, add more in, and keep stirring/adding broth until you run out of liquid and the rice is cooked, about 25 minutes. 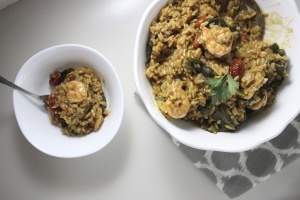 Remove the risotto from the pan and cook the shrimp for 90 seconds on each side on medium heat. To assemble the dish, peel the skin from the poblano peppers and roughly chop. 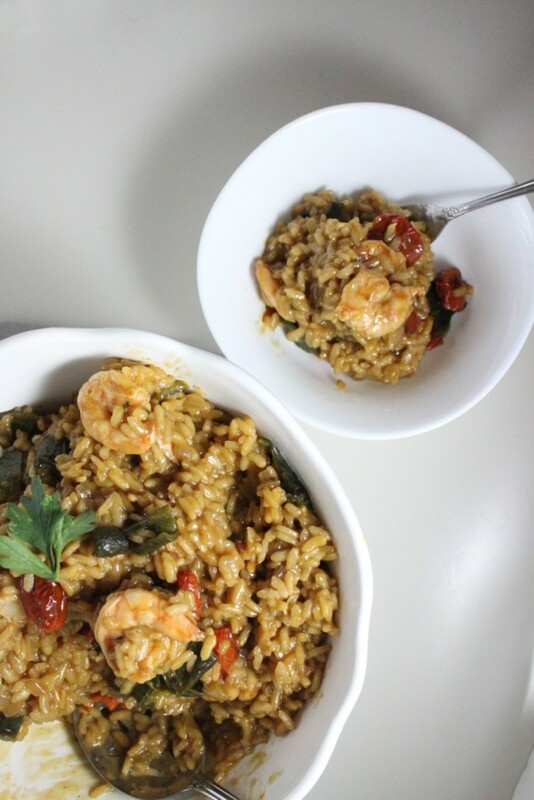 Mix with the risotto and cherry tomatoes and top with the shrimp. Thanks to Spotify for introducing me to this awesome new artist, Lissie. Not gonna lie, this song makes me feel like I’m walking down the street of my small town in 1984 and listening to Stevie Nicks, but that’s impossible since I was born in ’88. You got me right? Enjoy!